Before using this unimposing little plane I was doubtful that it could get much work done but having put it to work in the shop I am convinced that it really performs. It brings an effective combination of toughness and control to curved work and hollowing. The plane has a bevel-up A2 blade bedded at 20̊ and a 3 1/2″ long double convex sole with a shallow 27″ radius along its length and a steeper 3″ radius across its width. The blade is secured with a simple cap and thumbscrew mechanism and is adjusted by hand or by tapping with a small hammer. Nothing complicated with this tool, it goes right to work. The “squirrel tail” handle is the key to controlling the plane. The dome of the tail nestles in the lower part of the palm of the hand while the fingers surround the plane’s body with the index finger settling on the round depression at the front of the tool. This allows one to adjust and balance hand pressure toward the front or back of the tool as needed in order to engage the blade to cut on a curved surface. 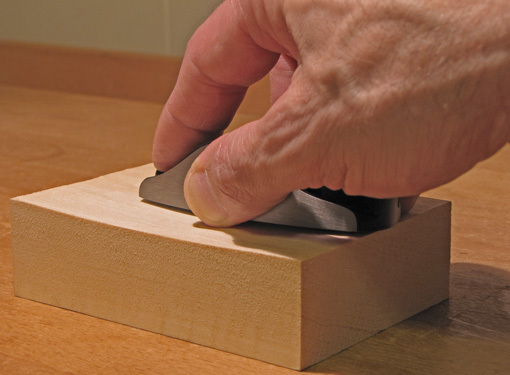 I find this makes it easier and more natural to control than other convex sole tools such as a spokeshave. The mouth opening is quite wide which, along with the curved blade, and lightweight handiness of the plane, allow quick back and forth strokes, much like the action of a scrub or jack plane. I find this tool is best used as a sort of mini jack plane for hollowing. The photo below shows an example. I bandsawed a shallow lengthwise curve into a 27″ long piece of plump 5/4 9″ wide cherry which will be used as the top of a wall cabinet. I used the convex sole plane to efficiently remove the bandsaw marks and refine the curve. The plane felt like an extension of my hand allowing me to work intuitively as I formed the curve to my liking. The shallow scallops that remained were easily removed first with a curved Surform rasp followed by an Auriou curved “ironing rasp,” hand scraper, and sandpaper. While I’m very happy with the L-N convex sole plane and recommend it, I would consider some design changes if I could have my preferences. It is a bit undersized for medium scale work, although an increase in size might sacrifice some of its handiness. A slightly larger radius across the width of the sole would suit more of my work. Perhaps a choice of sizes and soles could be made. Finally, knurling or a coarse surface on the widest parts of the sides would allow a better finger tip grip. I guess I can add that myself. This tool review is unsolicited and uncompensated. How will you go about sharpening this blade? I sharpened it freehand. I kept the factory curve and 25° primary bevel and added a 32° secondary bevel. Seems to be fine. Looks interesting. The norm in me would just use a belt sander to clean the bandsaw marks off. However, like all LN tools looks beautiful to hold and use. I agree that a little larger would be helpful in cabinet work. Here the primary use of the plane is to refine the curve. Removing the bandsaw marks just happens along with that. I have an oscillating vertical belt sander but it wouldn’t give nearly the incremental control of the plane for shaping the curve. I’ll use whatever works best and in this case it’s a plane for me. Do you have a 113? Unless I misjudge the exercise here, I think a 113 would have been a good alternative. I don’t have a 113 circular (compass) plane. I tried one years ago and found it to be more of a pain than a help. The curves in my work are almost never a constant radius. Especially for concave curves, unless the compass plane’s sole is constantly adjusted (hit-or-miss), it tends to lead me to make a boring, constant-radius curve. If I adjust the sole to be more curved than any part of what I’m working on, I’m back to rocking the plane to feel for the blade to engage. I can do that better with the little L-N nestled in my hand than with a top heavy compass plane. The short-soled L-N gives me more intuitive control and it’s simpler. 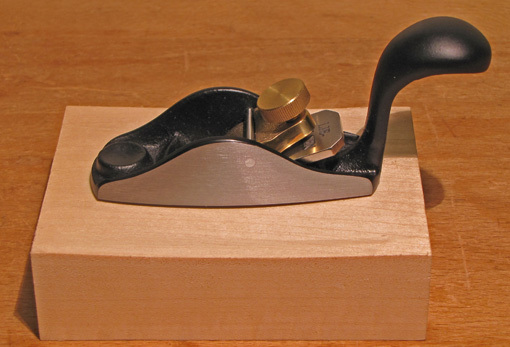 Also, the curved blade of the L-N acts like a scrub or jack plane since only a narrow width is cutting. You’ve got me thinking about this and I have been tempted to try a compass plane again because it would have some advantages but I think it won’t get a place on my tool budget. Of course, there’s more than one good way to get work done. I’ve found the small chairmakers wooden compass plane Mike Dunbar uses (I think Highland offers it in their chairmaking tools section for like $100) is very effective and nice to use. I think a 113 could pull off some fair curves or french curves – curves that tend to be parts of spirals rather than parts of circles or even parts of ovals simply by working different parts of the curve separately. I often have to do this even with symetrical – parts of circle – curves because of grain demands; i.e., go one way at one end and the opposite at the other so as to minimize tear out. I got my 113 for less than $113, and it’s in good shape, so it’s not like these tools are prohibitively expensive to try out, and a re likely easy to resell too. I’ve had my eye on that Leon Robbins plane for a while. Thanks for reminding me of it; I may give it a try sometime. I understand what you are saying regarding the 113 and if it works for you, great. There’s more than one good way to get work done. I did not say I dislike all constant radius curves, but for the work I like to do, I generally find them boring. I’m sure that there are pieces that I like made by other woodworkers that, when measured, would contain arcs of a true circle.